This volume is the eight in the annual series and the third of its kind published with the Presses Universitaires de Liège. The State of Environmental Migration aims to provide its readership with the most updated assessments on recent events and evolving dynamics of environmental migration throughout the world. Each year, the editors select the best graduate student work from the course “Environment and Migration”, taught by François Gemenne and Caroline Zickgraf at the Paris School of International Affairs (PSIA) of Sciences Po. Presented in this edition are displacements induced by some of the most dramatic disaster events of 2017, including Hurricane Irma and Cyclone Enawo, as well as analyses of migration flows related to a variety of environmental occurrences throughout the year spanning the globe. SEM 2018 thus represents another stepping stone towards understanding how the adverse effects of climate change and disasters alter migration patterns. 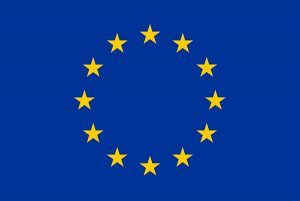 The publication was launched in November 2018 during the third and final EDGE annual conference which took place in Bratislava, Slovakia. The State of Environmental Migration 2018 can be ordered through the below order form or on the website of Presses Universtitaires de Liège. 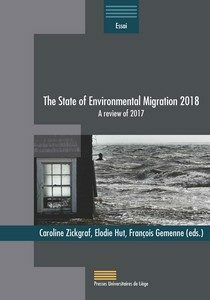 The Hugo Observatory of the University of Liège is proud to present The State of Environmental Migration 2017: A review of 2016, the seventh annual volume of the series, which selects and compiles Masters student’s work from the course « Environment and Migration » taught by François Gemenne and Caroline Zickgraf at the Paris School of International Affairs (PSIA) of Science Po in an ongoing partnership with the International Organisation for Migration (IOM). 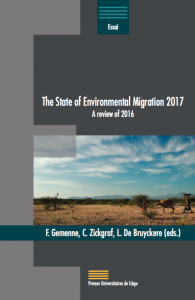 Following last year’s The State of Environmental Migration 2016, this year’s edition is edited by François Gemenne, Caroline Zickgraf and Luka De Bruyckere of the Hugo Observatory in the framework of the Horizon 2020 Environmental Diplomacy and Geopolitics (EDGE) project. The publication was launched in December 2017 on the second EDGE Annual Conference: Politics of the Earth. The State of Environmental Migration 2017 can be ordered through the below order form or on the website of Presses Universtitaires de Liège. 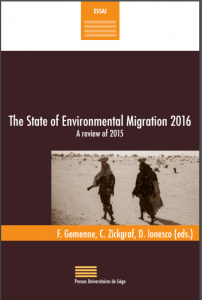 All chapters of last year’s The State of Environmental Migration 2016 can be consulted below. All previous editions of the series (2011-2015) can be consulted on the website of the Hugo Observatory.